The luxury single-family homes built by Sharbell range from nearly 2,400 to over 3,300 square feet. Located in Montgomery, New Jersey, Tapestry at Montgomery is a popular active adult community in Central Jersey. Its desirable location amid the rolling hills of southern Somerset County provides a tranquil environment while still offering close proximity to daily conveniences. Tapestry at Montgomery is also not far from popular destinations like Trenton, New York City, and the Jersey Shore. With a great location and amenities to match, active adult homebuyers will appreciate the lifestyle offered by Tapestry at Montgomery. Though the community is on the smaller side, Tapestry at Montgomery’s clubhouse is an inviting facility with a diverse mix of amenities. Social areas in the clubhouse are designed to make it easy for residents to relax and meet their neighbors. Residents can enjoy the cozy library or express their creativity in the arts and crafts studio. The sports lounge offers a wet bar, card tables, billiards, and mounted televisions. Health-minded residents can stay in shape with a trip to the clubhouse’s fitness center. This state-of-the-art facility provides locker rooms, cardiovascular equipment, and strength-training machines. Residents can also swim in the outdoor pool or take in a game of tennis, bocce ball, or shuffleboard. With plans for 218 single-family and attached homes, Tapestry at Montgomery represents a more intimate 55+ community. It is being developed by Sharbell, an award-winning local builder, with a focus on comfortable homes and desirable amenities. Discerning homebuyers are often drawn to Tapestry at Montgomery for its thoughtful home designs. Each floor plan offers a minimum of two bedrooms, two-and-a-half bathrooms, a den, and a two-car garage. 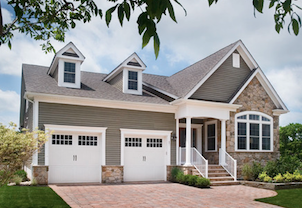 Single-family homes range from 2,488 to 3,302 square feet. Designs promote main-level living with first-floor master bedroom suites, yet second-story lofts provide additional bedrooms, bathrooms, and bonus space. Some home plans offer optional elevators. Homebuyers who prefer an attached home can choose the Jacquard duplex model. This thoughtfully designed home is approximately 2,437 square feet. The main level features a spacious master bedroom suite, a second bedroom, a kitchen with a breakfast nook, a family room, a living room, and a dining room. A second-story loft adds a third bathroom and either a den or a third bedroom. Tapestry at Montgomery enjoys a prime location just two miles from the town of Princeton, which offers shops, restaurants, and other recreations. Several towns in the surrounding area offer charming historic districts and waterfront dining on the Delaware River. Closer to home, the Montgomery Shopping Center, which has several stores and a movie theater, is within walking distance of the community.